Sometimes things just fall into place. Energy and Capital editor Keith Kohl takes a closer look at why the tight oil boom is far from over. What is Saudi Arabia’s greatest fear? Energy and Capital editor Keith Kohl reveals why the Saudis' greatest fear may be coming true and what their next move will be to avoid collapse. Energy and Capital editor Christian DeHaemer says it's not the sharks in the water you have to worry about... It may not, in fact, be time to buy the dip. 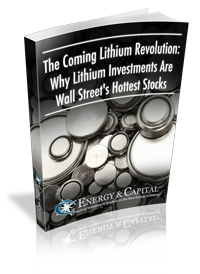 Energy and Capital editor Keith Kohl reveals the dirty little secret most investors ignore. Yet it’s one of the easiest investing axioms that individual investors like you and I can use to truly create life-changing wealth. This time last year, cobalt was the hottest metal on the planet. Now? Nothing. You barely hear about it, if ever. Energy and Capital editor Luke Burgess explores why this is the case and whether cobalt is still a good investment.